This popular Japanese cold soba salad is perfect for summer! 1. Cook noodles in salted water. Rinse and coat with a little oil to keep from sticking. Set aside. 2. Mix together sesame oil, ginger, mirin, sugar, wasabi and soy sauce. Pour over noodles and refrigerate, allowing the sauce to be soaked up by the noodles at least 1 hour. 3. 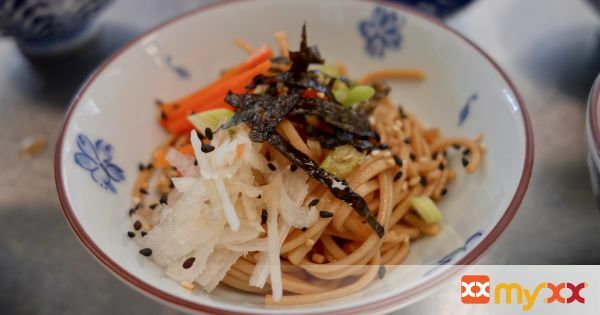 To serve, toss or garnish noodles with shredded radish, carrots, green onion, nori, and sesame seeds. Enjoy!